The cruises to East Greenland always end on Iceland, for logistic reasons. We leave the ship in Akureyri in northern Iceland and have to fly home from Keflavik Airport in the south-west. Normally I would have taken a plane bringing me to Keflavik, but as the group would take a bus ride through Iceland, stopping at several sites, I decided to jump along. It turned out to be a very long bus ride, with only a few very short stops. But it was still worth it, as I had never seen anything of Iceland except the airport and harbour of Keflavik. 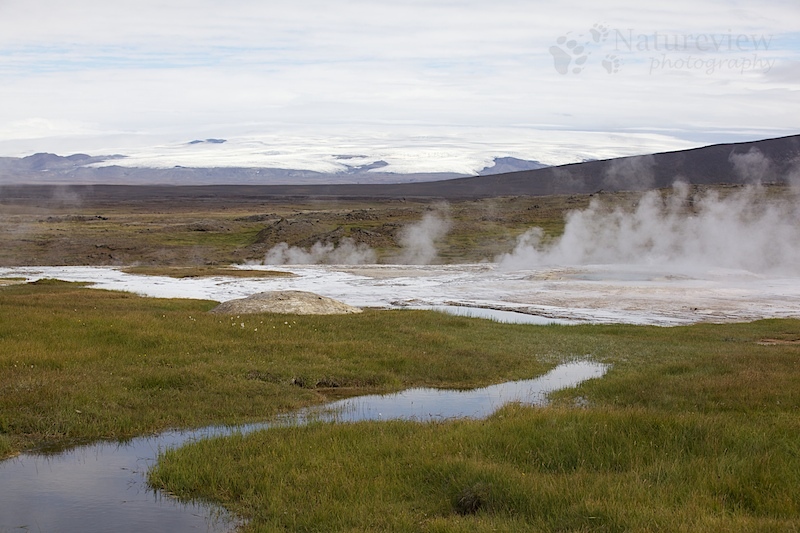 In this picture I’ve combined two parts of Iceland, the hot thermal springs and the large icecap at the horizon. Just a bit reminiscent of our Yellowstone Park in the USA. Thermal pools with grand mountains in the distance. Can’t judge that, never been to Yellowstone. Great pic. Visited Iceland a couple of years ago and yes, it is pretty weird. Was impressed by the spectacular waterfalls and geysers, which would suddenly spurt without warning every few minutes.